yachts, sailboats or catamarans in any of these locations. A private crewed yacht charter onboard a luxury catamaran or fully crewed sailing yacht (mono hull) or a luxurious Power yacht will offer you the ultimate opportunity to explore the most beautiful beaches and crystal clear blue tropical waters in the world. A private Yacht charter onboard charter yachts offers the comfort and flexibility in choosing activities tailored to your special interest. Windsurf all day or relax for hours on a secluded beach. The Cote d'Azur (french Riviera) has a glamour all of its own. From Marseille to Portofino the coastline is laced with beautiful bays, bustling towns, designer boutiques, excellent restaurants and legendary beaches. Cannes is lined with grand hotels and elegant promenades while Nice, a Mecca for artists, is charming with its own narrow streets and colourful markets. Monaco is as exclusive and exciting as its grand-prix, casino and very public royal family lead you to believe. Portofinio, reached by an overnight cruise across the Bay of Genoa, is one of the most picturesque ports in the Mediterranean. The Mediterranean is the location of choice of the rich and famous when it comes to yachts and yacht vacations. French Riviera yacht charters are among the most exquisite in the world. The Caribbean is made up of many islands, none more popular than the Virgin Islands. The Virgin Islands are a magical Caribbean archipelago of more than forty islands and cays. They seem to have been created expressly for the pleasures of yachting and water sports. There are many yachts that cruise these caribbean islands, from Caribbean power yachts, Caribbean sailing yachts and Caribbean catamarans. The main cruising destinations in the Caribbean are the US Virgin islands and the British Virgin Islands. These locations are always calm and sunny for most of the year. There are many charter yachts in the Caribbean ranging from Catamarans, power yachts and sailing boats. Choosing a yacht and your sailing destination is critical to your vacation being a success and that is a good reason why you need a qualified broker. We also offer charter yachts in these other caribbean destinations. Spanish vigin islands, Grenadines, St. Martin, Antigua, the windwards islands, the leeward islands, Puerto Rico, Bahamas islands, Turks and Caicos. Bare boat yacht charters was started for the yachtsmen who can do it all and it developed into serving those who have completed a sailing course. Today bare boating has spread across the world for the person who can captain a yacht and enjoy a sailing vacation not needing a crew team. The greek yachts featured are some of the industries top quality vessels carefully selected by our charter brokers and agents worldwide. 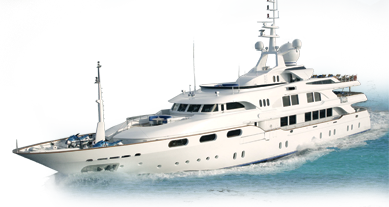 Super yacht Miracle(110 foot) possibly one of the industries top 8 guests luxury charter yachts, good value for a group who like the best of everything. Super yacht Starship (143 foot) manufactured 1988 with a refit in 2004. Starship is a glamorous performer with an air of unsurpassed richness. Northern Lights 132 foot sleeps 10 guests, manufactured by West ship marine in 2000 with her last refit in 2008.Well planned luxury power yacht. All cabins are all fully air-conditioned with full sized baths in all cabins. Super yacht Sovereign 120 foot sleep 12 guests, manufactured by Broward marine in 1993 with her last refit in 2005. Well planned luxury power yacht. All cabins are all fully air-conditioned and en-suite. Super yacht Aquasition 124 foot manufactured by Broward marine in 2007. Well planned luxury power yacht. All cabins are all fully air-conditioned and en-suite.